Hello, everyone! It's been awhile since I've been on the forums. I have something I want ask you guys in regards to a couple of hidden features that are only found in the Japanese 5.45 version of VOOT for Dreamcast. Apparently, the Cust-Plus loader can unlock a field viewer and a Virtuaroid model viewer that are both hidden in the game somewhere. I emailed Scott Robinson(the creator of the Cust-Plus loader)two and a half years ago asking him if it was at all possible to use Cust-Plus on a Dreamcast Emulator. I figured doing that was impossible, since he told me he didn't have time to get his Dreamcast build environment working again. However, he did also tell me that the field and model viewers were a "two byte patch in memory." So now I'm attempting to use Cheat Engine's Memory Viewer in conjunction with my Dreamcast emulator in the hopes of patching the memory so I can access the field and model viewers. The only clue I have found so far is, while the Dreamcast emulator process is running(and while the game is on the main menu screen), I used Cheat Engine's Memory Viewer and searched for the text word "viewer." My search yielded 2 results, both of which can be seen highlighted in red letters and circled in the picture I've attached to this post. But apart from that, I don't know where or how to start the patching procedure. Most likely because I don't believe I have any record of anyone trying anything like this in the past. And trust me when I say I've searched everywhere on the internet. Youtube videos, various forums, tutorials, and so on. So if anyone can please assist me in any possible way, I would greatly appreciate it. Okay that's just text, but it's very helpful for determining two things: 1) these rumored viewers exist 2) they can likely be enabled via secret option menu settings since the other text around them looks like menu text. There's no data or anything else in the memory region you found though, it's just words. The debug mode definitely exists in JP VOOT and has map/model viewers. I didn't hear about any rumor otherwise I could have confirmed it. The menu option can be unlocked in US VOOT but it doesn't work (game crashes so the code is apparently gone or otherwise broken). I should have an Xploder save somewhere that unlocks these, I'll see if I can dig it up. Here are some old screenshots I found of the menus. I'm still looking for the Xploder save, though. Does anyone happen to have an Xploder image I can use to check my save files? MentholMoose wrote: Here are some old screenshots I found of the menus. I'm still looking for the Xploder save, though. Does anyone happen to have an Xploder image I can use to check my save files? If you're talking about Dreamcast disc images(like cdi), there are plenty of disc images for Codebreaker(the US equivalent of Xploder) floating around on the internet. Or is that not going to work? Does the Codebreaker support Xploder save files (FCDCHEATS)? If these modes can be unlocked via mere save file editing, then perhaps I did not look hard enough for secret menu options that could be unlocked via the save files in Xbox 360 VOOM, VOOT, and Force. I'll maybe look again sometime. MentholMoose wrote: Does the Codebreaker support Xploder save files (FCDCHEATS)? After some very careful looking, I came across some Dreamcast VMU saves on http://bswirl.kitsunet.org a while ago, and saw some files in the "Codebreaker" section that had the name you mentioned, which was "fcdcheats, and also saw some more save files in the "Xploder" section, which amore files with the name "fcdcheats." 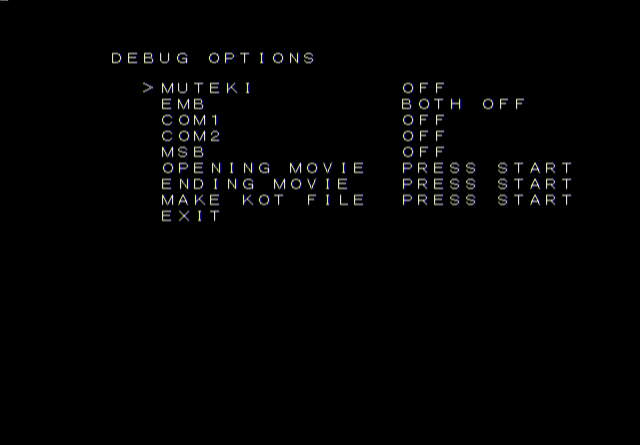 So I guess the answer is yes, Codebreaker does support Xploder save files. Okay cool let me check the save files I have to see if any have the code to unlock the debug mode. MentholMoose wrote: Okay cool let me check the save files I have to see if any have the code to unlock the debug mode. Alright, that sounds good to me. Thanks for taking the time to do this. Sorry for the double post, but have you had any luck in finding the save file with the option to unlock debug mode? I couldn't figure out how to load the save file in Codebreaker. Any ideas? MentholMoose wrote: I couldn't figure out how to load the save file in Codebreaker. Any ideas? ...Dang. Well, I do have somewhat of an alternate idea, though I'm not sure what you'd think of it. A little over 2 weeks ago, I actually managed to get the Debug mode working myself on the Demul Dreamcast Emulator with a Codebreaker .CDI image. Here's the thing though, I found that the process I used only works on one particular build of Demul, which is: Build 0.7A, build date 221215. I even took the liberty of putting together a Readme text file which details the exact steps I took in order to get it working. Shall I put it on my next post as an attachment so people can download it? Off-Topic: My 50th post on the forums! Yay! How did you get the debug mode working? Porcupine wrote: How did you get the debug mode working? Ok, since it doesn't look like the forum accepts text files for attachments, I guess I'll just have to paste the contents of the readme file here so everyone can see. Get ready though, this is going to be quite long. How to enable VOOT Extras on a Dreamcast Emulator without Cust-Plus. First and foremost, make [i]absolutely sure[/i] the Dreamcast emulator you're using is Demul version 0.7a, build date 221215. No other version has [i]fully[/i] functional disc swap functionality [i]and[/i] working Save functions. Also, make sure you're using a .GDI version of VOOT, because .CDI version will not work. 6. This document, for reference. Step 1. Open up "demul.exe." Step 2. Go to "Config->GD-ROM." Step 3a. If an image file is already chosen, click "Eject." Otherwise, skip to Step 3b. Step 3b. Click "Select," and find your CodeBreaker .cdi image and click "Open." Step 5. Got to "File->Run Dreamcast." Step 6. After the Dreamcast and Sega boot-up logos have appeared, You'll see a black screen with the words: "This Product is not endorsed or licenced by Sega Enterprises Ltd. Press a button to continue." Step 7. Follow the prompt on-screen and you'll be at the CodeBreaker main menu. Step 8. Choose "Start Game." Step 9. The screen will say "Please Open Disc Lid." Step 10. Go to "Config->GD-ROM" again and click "Eject." Step 11. The screen will then say "Please Insert The New Disc." Step 12. Click "Select," find your Virtual-On Oratorio Tangram image and click "Open," and then "OK."
Step 13. *IMPORTANT! * It may [i]seem[/i] like the emulator has frozen up after loading the new image. However this is [i]not[/i] the case. This is [u]normal[/u] for this version of Demul! Press the Y button on your controller(or the button that's assigned to it) and you'll be back at the CodeBreaker main menu. If the game hasn't been detected once before, go to Step 14a. Otherwise skip to Step 15. 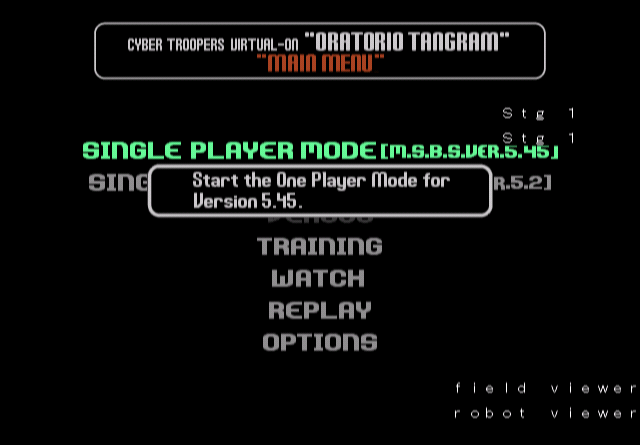 "CYBER TROOPERS VIRTUAL-ON ORATORIO TANGRAM"
"START - Add Game to the cheats"
Step 14b. Press the Start Button on your controller(or the button assigned to it). You'll be taken to the Cheat Browser screen. 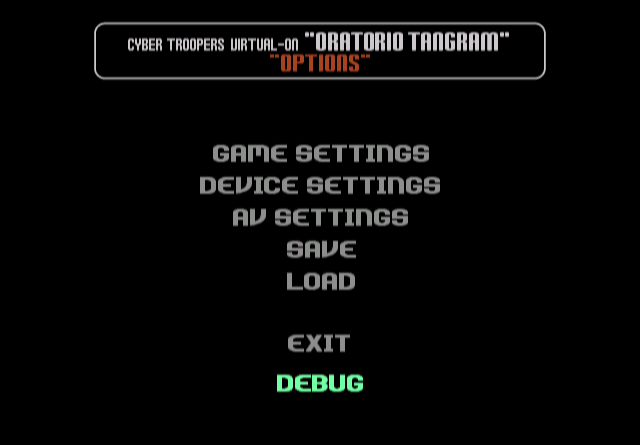 You'll see that a new game entry is a the top of the list: "CYBER TROOPERS VIRTUAL-ON ORATORIO TANGRAM." Step 14c. Using the button instructions on-screen, input any new cheat codes that you want to use for your gaming session. Step 14d. When done, press Start. You'll be asked to either save or discard changes that were made. Press the A button to save. "START - Show Cheats for this game"
Step 15. Choose "Start Game" and, if you followed the instructions [i]precisely[/i], you'll be taken to the VOOT startup screen, with the cheats(hopefully) activated! Step 16. *IMPORTANT! * If you want to change/add cheats the next time you play, do not forget to delete the file               named "dc.flash" in the "nvram" folder in the Demul directory after each gameplay session. This file is automatically created/modified whenever the emulator is turned off. The ONLY way to exit out of the field/model viewers is to press the A,B,X,Y and Start buttons simultaneously. This will cause a screen with the words "Reboot System" to appear for a second before before taking you back to the Main Title screen. 2. Enabling customized Virtuaroids for all game modes. https://gamehacking.org/faqs/hackv500c.html for telling me what type of Dreamcast code is needed for enabling MOST extras in VOOT(which is the "Type-00" Dreamcast code). Scott Robinson(the creator of the Cust-Plus loader) for telling me where the memory address for enabling Debug Mode is, as an example. Last edited by The World - 2.0 on 10 Dec 2016, 14:23, edited 1 time in total. Thanks, those memory locations will help me to possibly find debug modes in the save files of all three Xbox 360 games. But I'm not too hopeful so I won't try until some time next year. It would be even more helpful if you have the memory location in the Dreamcast VOOT save file, I'm assuming those are memory locations in RAM which can be very different. Porcupine wrote: Thanks, those memory locations will help me to possibly find debug modes in the save files of all three Xbox 360 games. But I'm not too hopeful so I won't try until some time next year. It would be even more helpful if you have the memory location in the Dreamcast VOOT save file, I'm assuming those are memory locations in RAM which can be very different. That means debug_mode is an 8-bit long unsigned integer (a single byte) located 0x8C bytes into the gamedata_opt structure. After I found all that out, all I did was use a "type-00" Dreamcast codebreaker code to set the byte at 0x8ccf9f58 to 01, and it worked! Sorry in advance for the double/necropost, but I've recently(about 2 months ago) discovered an easier way to access the Debug mode and other extras on the Dreamcast version of VOOT. Therefore, I'd like to ask that you guys please post in my newer topic, instead of this one, ok?